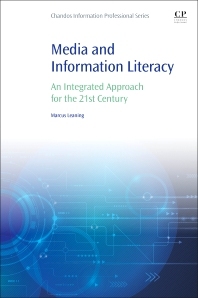 Media and Information Literacy: An Integrated Approach for the 21st Century provides a novel rationale for the integration of media and information literacy and gives direction to contemporary media and information literacy education. The book takes a synthetic approach to these two areas, presenting critical histories of both. The book explores the influence of political forces and educational practice on media literacy and the contemporary media environment, focusing on computing and mobile technology as a platform for existing and non-computational media. The final section considers a new rationale for the adjustment of content and activities into a combined project, building on a range of skills from contemporary media, reconsidering the mission of media literacy, and advocating that media and information literacy be expanded out of the classroom and positioned as a ‘public pedagogy'. Dr Marcus leaning is Senior Fellow in Media and Information Literacy in the School of Media and Film at the University of Winchester in the UK. A sociologist by training he researches in the fields of digital media, media and information education and other selected topics. He is the author of The Internet, power and Society: Rethinking the Power of the Internet to Change Lives, 5 edited collections and numerous book chapters and journal articles. Marcus is a Fellow of the Royal Society of the Arts and is a Senior Fellow of the UK Higher Education Academy.